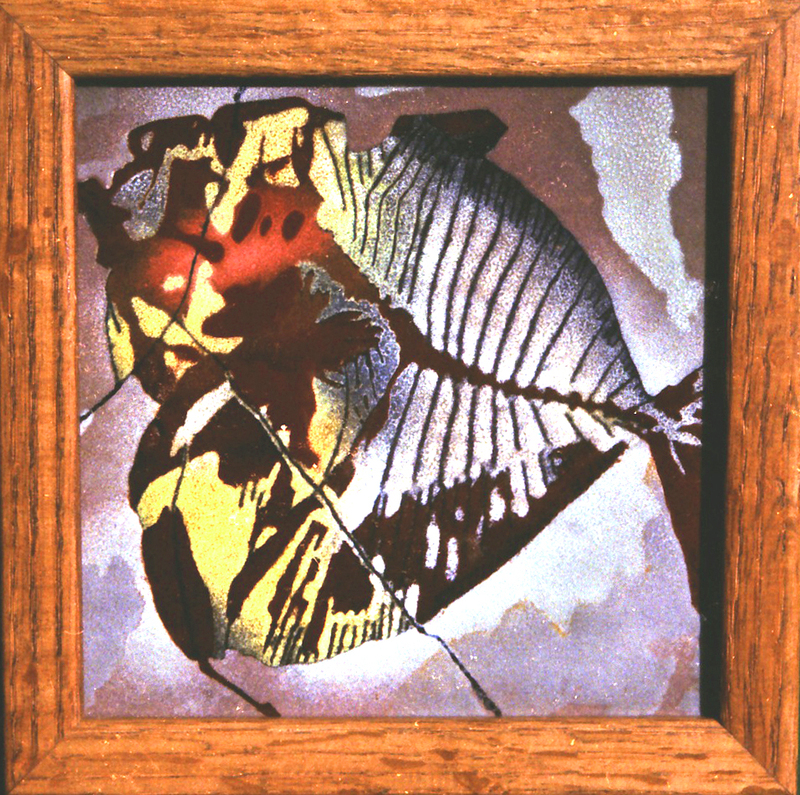 This image of a fossil fish, six inches square, is one of the larger enamel pieces in this series. The base is a steel panel that had previously been coated with enamel in an industrial process. Relatively simple techniques were used to produce the piece. Sifting fine-grained enamel onto the wetted surface produced the major areas of different colors; the piece was fired after each color. Masks cut from absorbent paper, wetted and placed on the surface, controlled the boundaries of the areas. A technique known as sgraffito was used to form the linear features such as ribs and cracks. 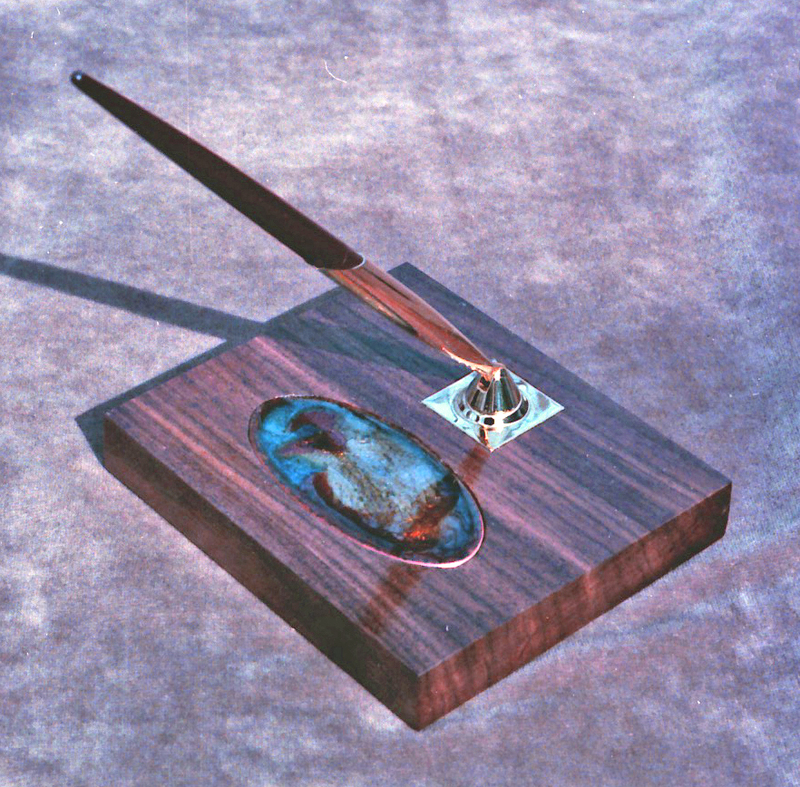 A wooden stylus scratched through the coating of dried enamel prior to firing. The image is reminiscent of the scorpion fish presented in an earlier posting of this series. 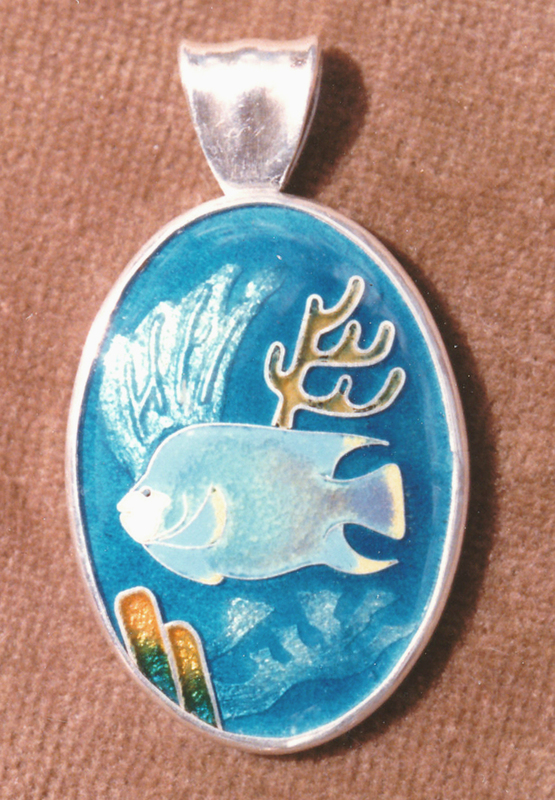 That piece is presented here again because it is an outstanding example of enamel design based on nature, and specifically on a fish. As previously noted, the source of the image was a photograph of a living fish in deep ocean waters. The bone structure was visible through the transparent flesh. 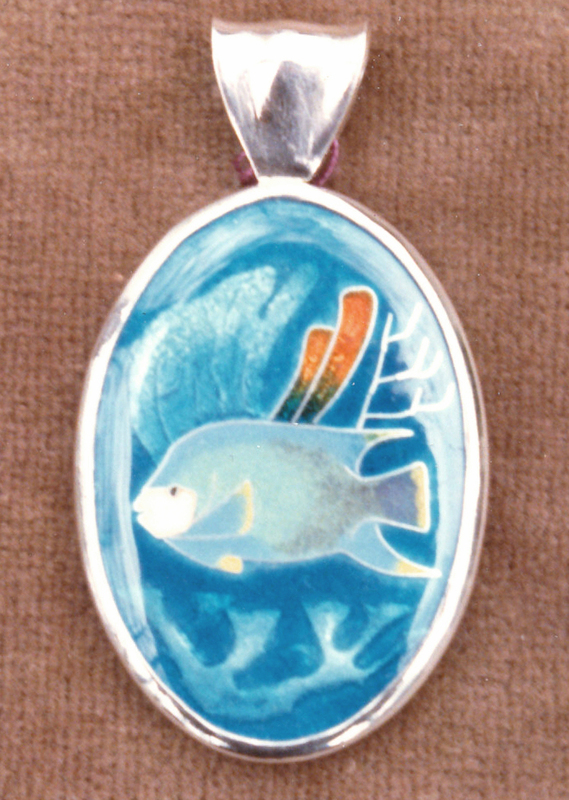 The next two pendants show an angel fish in shallow tropical waters above a reef. 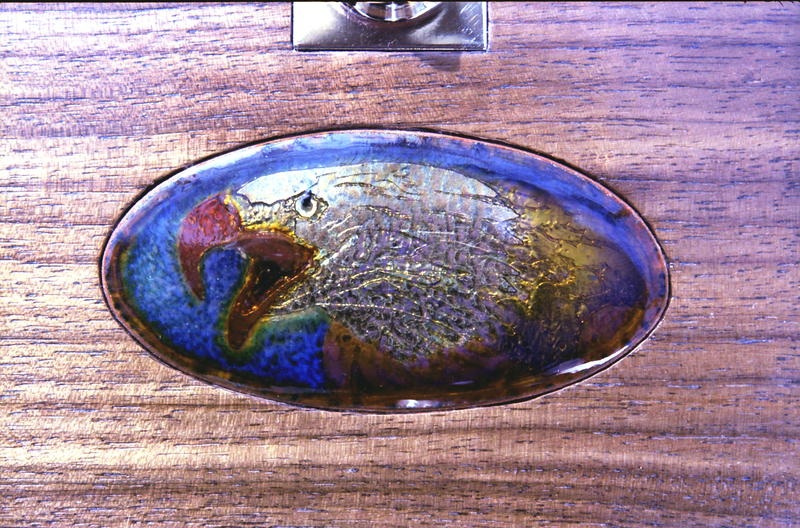 Silver wires mark the part of the image formed by the cloisonné technique. Other features, including the fish, employed the basse-taille (low relief) technique. Thin sheets of silver were embossed, put in position, and covered with sufficient transparent enamel to build a smoothly rounded surface. 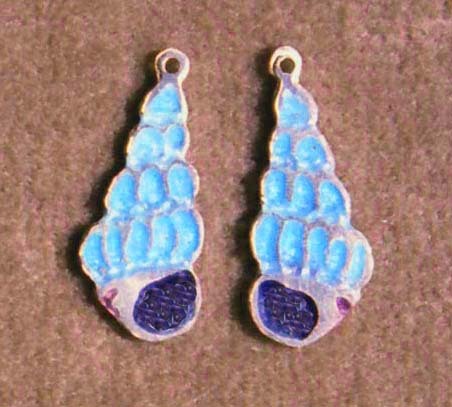 Seashells are a rich source of design for enamels of all sizes. 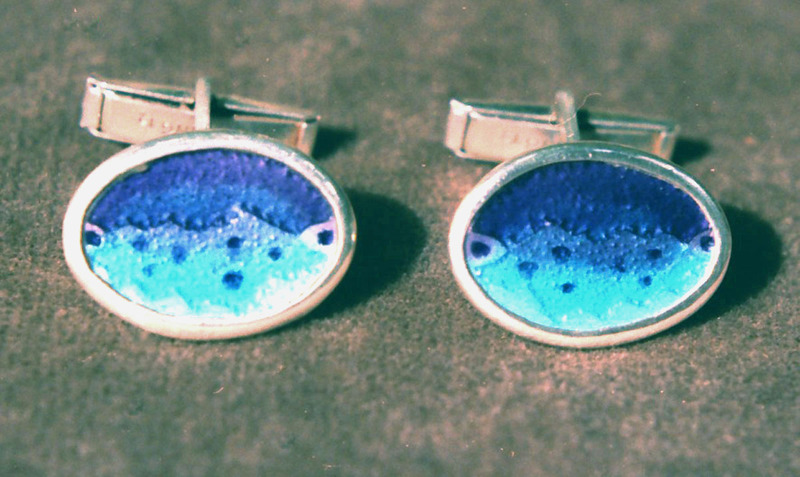 I found them particularly useful for small pieces such as cufflinks, earrings, and small pendants. 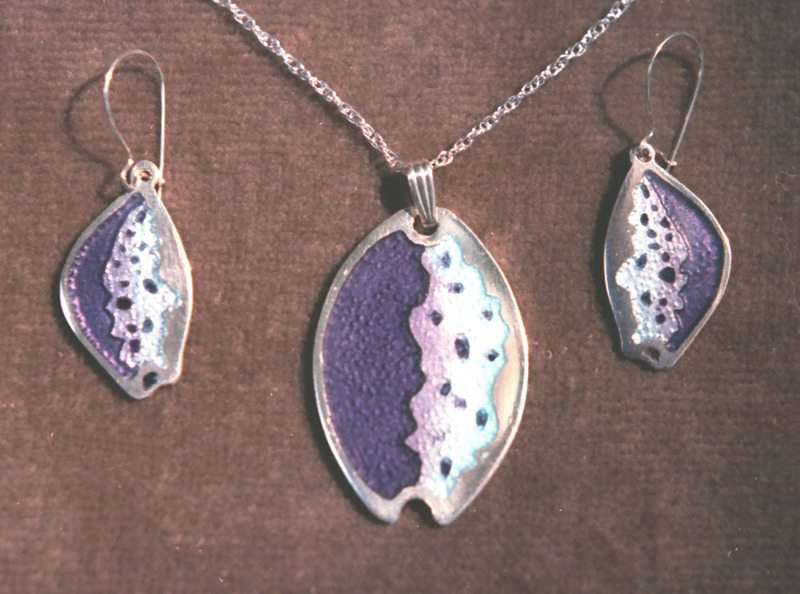 …and a design based on an iridescent, multicolored abalone shell. All used the basse-taille technique with low-relief designs etched out of fine silver by nitric acid. 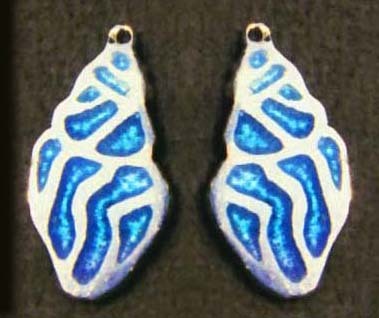 The next two pieces represent the champlevé technique, in which the design is expressed by alternating areas of silver and enamel at the surface. 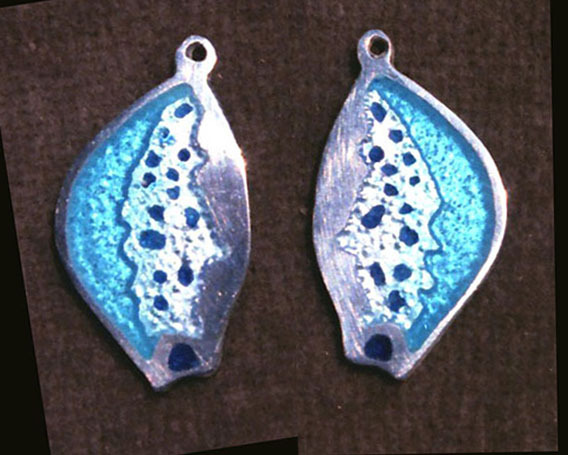 The enamel fills pockets etched out of the fine silver by nitric acid. 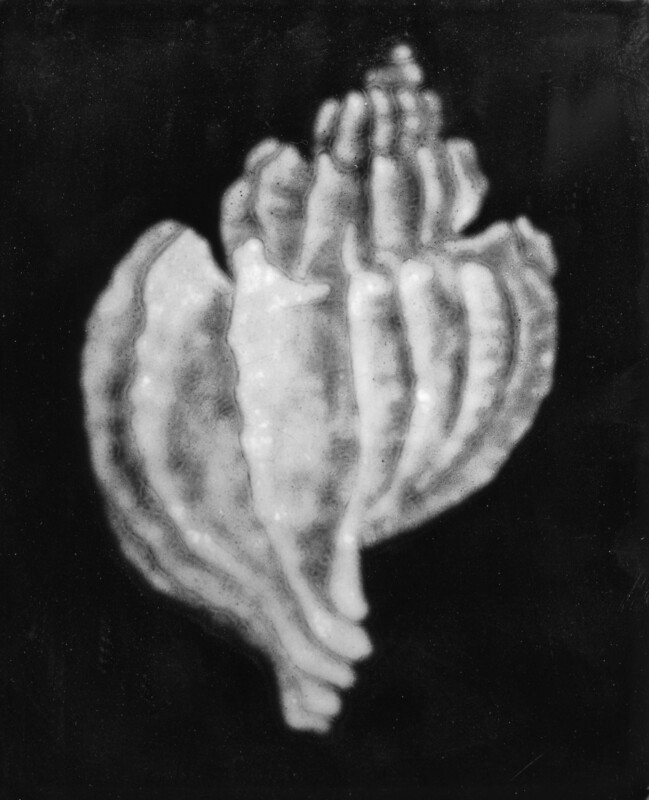 The image of a conch shell appears on the next piece, a heavy copper sheet about five by six inches in size. This was a learning piece for the Grisaille technique. I know of no other way that such smooth transitions among multiple shades of a color (gray in this case) can be produced with opaque enamels. On a thickly enameled black base, successive layers of white are built up. Where the darkest gray is wanted, the fewest white layers are applied. Where the lightest gray is wanted, the largest number of white layers is applied. The piece is then high-fired (at temperatures above the normal range of 1400 to 1500 degrees Fahrenheit). All the white enamel disappears. A normal firing then restores the image. In the restored image, edges of layers cannot be seen. Transitions between different shades are smooth and gradual. Some grisaille pieces from many centuries ago were colored by applying a top layer of transparent colored enamel. This is comparable to colorizing black and white photos by applying transparent colored ink. In part II of this series, transparent enamels have colorized the grisaille image of the Healing Fragrance piece. 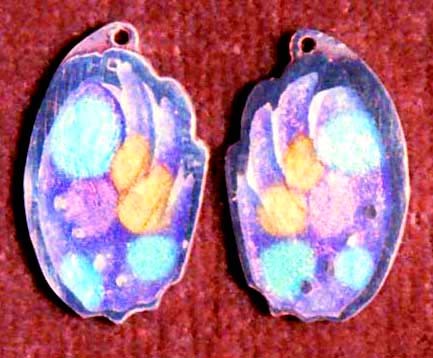 The lead-bearing enamels that I used gave interesting, surprising, and often beautiful results when fired at high temperatures, about 1,800 degrees Fahrenheit, on copper. (This contrasts with normal firing temperatures of 1,400 to 1,500 degrees.) 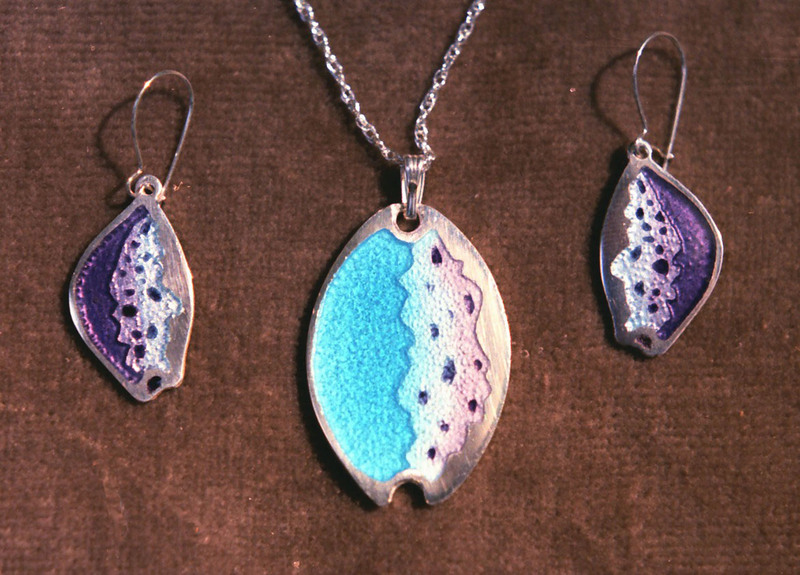 Transparent enamels often gave unexpected colors and lusters. For example, a pink enamel called tea rose produced a brilliant gold with bright metallic luster. An example of this is shown below in the Celtic Wreaths enamel, previously introduced in part VI. Also, many opaque types of enamel became transparent during high firing, and led to still more colors, always with a metallic luster that is not well rendered in the photographs. A desk pen set illustrates results of an experiment using both transparent and opaque enamels on the familiar eagle design. 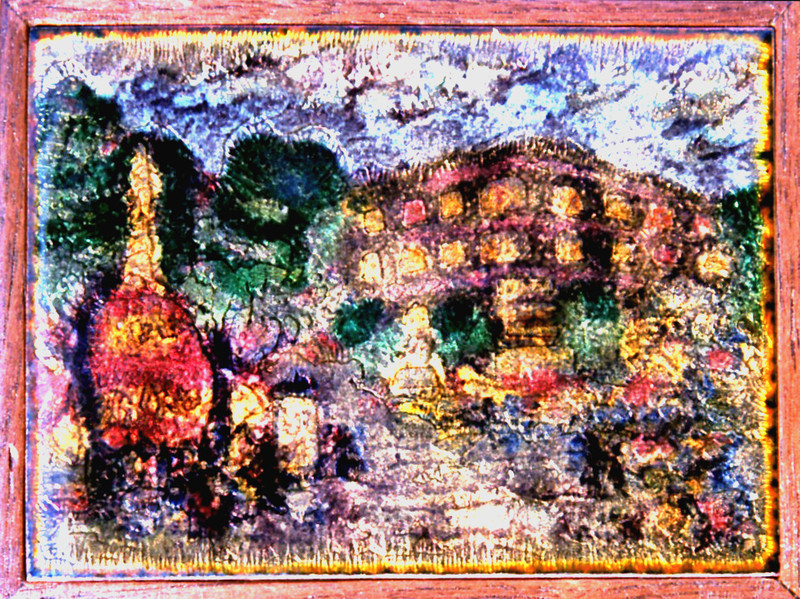 The experimental piece shown below was an attempt to portray the lights and colors of Paris on a summer evening. Its shortcomings in definition and form, a frequent casualty of high firing, are partly balanced by the richness of color and luster. 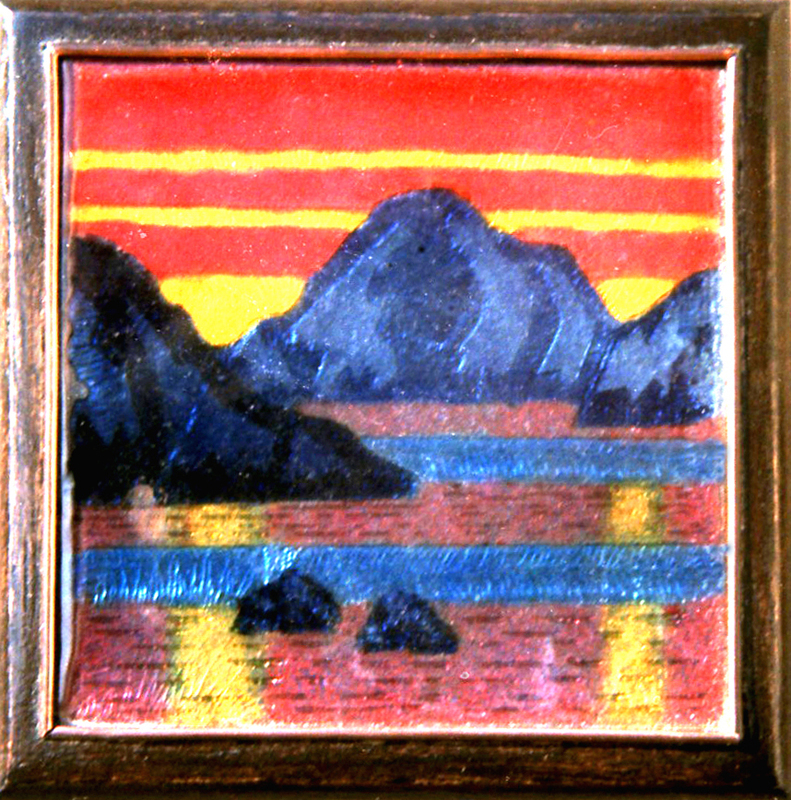 The fictitious scene of a harbor at sunset takes full advantage of the warmth and brilliance that are easily produced by this technique. All of the pieces shown here are basse-taille products. 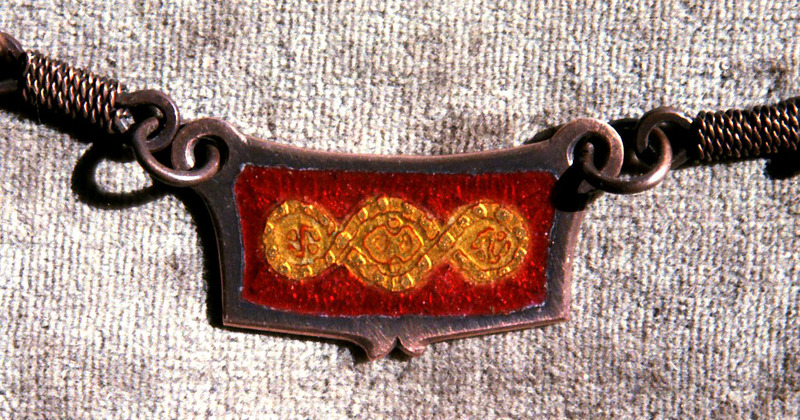 The low relief was etched in copper by a mordant and then covered by enamel, built up to a flat or gently curved surface. High firing was a fruitful area for experimentation. It was the scene for many advances of the art in the 1980s, and the subject of many workshops. In this context, my own experiments barely scratched the surface. 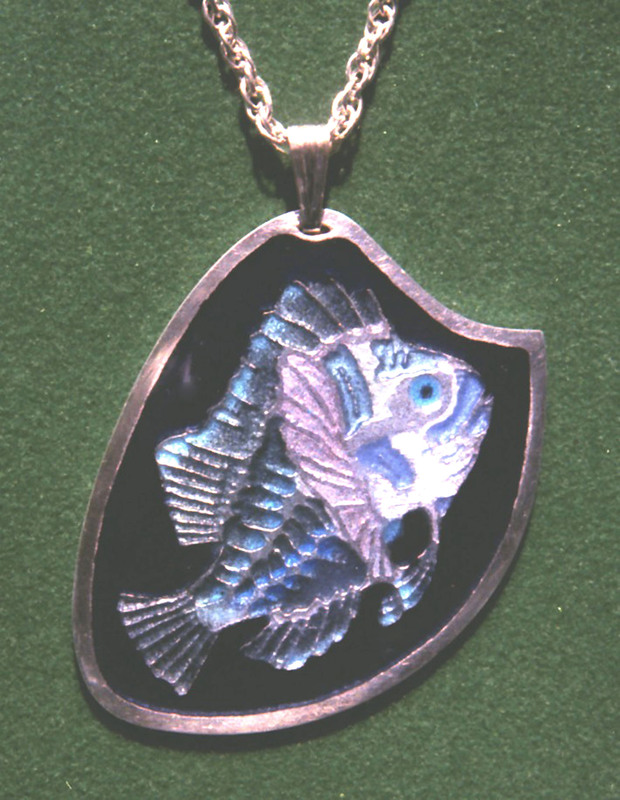 Scorpion Fish is a pendant enameled in the basse-taille (low relief) technique. 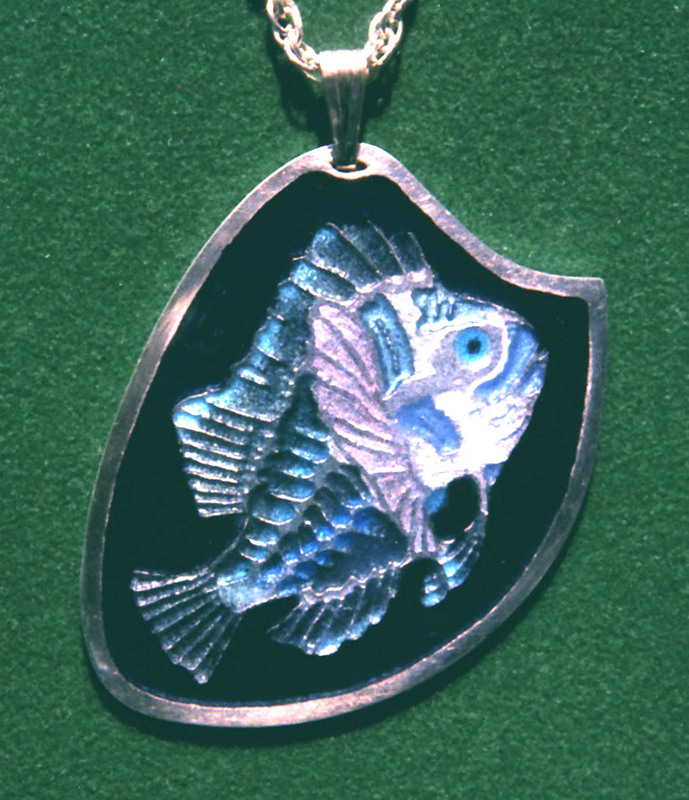 The image was etched by nitric acid out of fine silver, and was then completely covered by enamel. 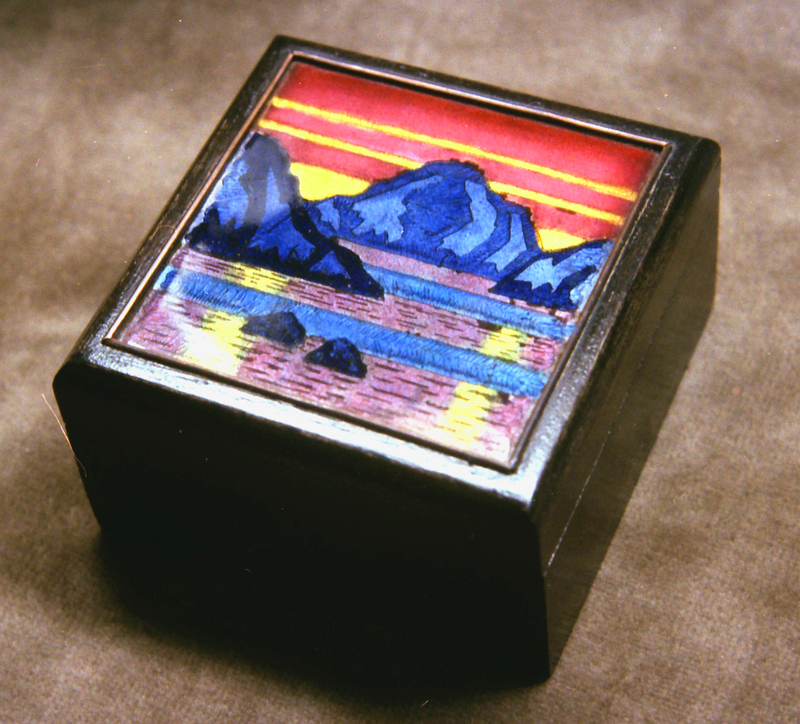 Many means other than etching can be used in this technique to produce the three-dimensional image. The design was based on a photograph of a live fish in deep ocean waters. Its flesh was transparent and the skeleton was visible. This made it an ideal candidate for the basse-taille technique. Opaque black enamel was used in the first layer in the background area and the pupil of the eye. All subsequent layers of enamel were transparent, some colorless and others in various colors. These were built up until the entire low-relief image was submerged, and the top surface was honed flat and polished. Strictly speaking, the silver border is not a feature of the basse-taille technique. It is borrowed from another style of enameling, champlevé (raised field), where a design is created by bare areas of the underlying metal alternating with areas of enamel. 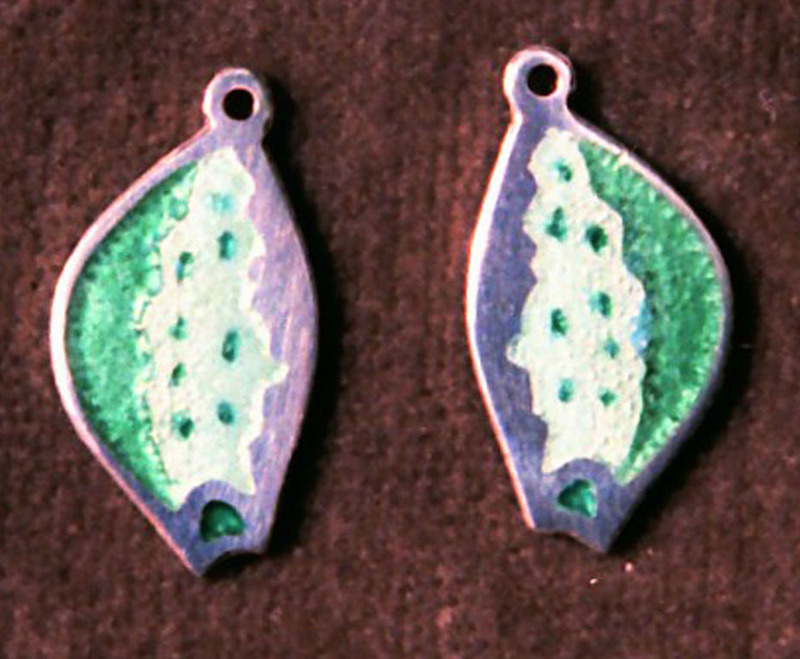 Other examples of the combined use of the two techniques are shown in the pendants and earrings below.